After 5 years of silence, the Norwegian black metal crew Sarkom is back with a vengeance! They got a lot of praise for the albums “Aggravation Of Mind” and “Bestial Supremacy”, and was an active touring band around Europe. 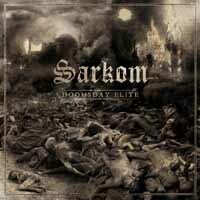 After working on other projects, Sarkom is now fully back, and “Doomsday Elite” offers a fierce and crushing black metal album. On this album, Sarkom has developed their sound and brought in new elements in their music, without losing their original sound. “Doomsday Elite” is a great step forward for the band, with lots of variation and supreme black metal tracks. Uruz from Urgehal is playing drums on the album. Other guest performances on the album include Psy Coma (The Kovenant), Haan (Svarttjern), Nachtgarm (Negator), Thrawn and V. Larsen.